The landscape of Scales Moor is like something from another planet. It comprises a broad plateau some 3 miles long and about ½ mile wide on the shoulder of Whernside, overlooking the Chapel-le-Dale valley. It is slightly tilted, lowest at the north east and rising to the south west and has no walls. The whole area is a SSSI on account of extensive limestone pavement and moorland flora. 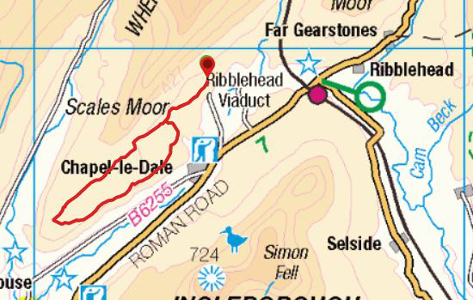 It is not well frequented but criss crossed by quad bike tracks and indistinct paths, though there is a bridleway across it running from Ellerbeck to Scar End, then down to Ingleton. You probably won't know if you're on the right path all the time and may find you are crossing rough moorland at some stage but in clear weather there shouldn't be too much of a problem. The pleasure is more in exploring this fascinating landscape than following a set route. It is best avoided in mist. There are numerous open pot holes on the moor, some very deep, so keep children and dogs under control. Start as for the Ellerback and Southerscales walk by turning right across a field, then continuing on the farm track past Bruntscar Hall to Ellerbeck. Beyond Ellerbeck cross the ford and turn left down the track towards Chapel-le-Dale but before reaching the walled lane strike off to the right onto the moor. There are tracks and indistinct paths but if you keep the boundary wall on your left you should be OK. The wall goes in an out a bit to start with so cut across rather than following religiously until you pass the farm of High Scales on your left. Continue following the wall, which itself follows the line of cliffs dropping down into the valley. There are tremendous views across to Ingleborough and down into the valley along this section. Follow the wall and / or cliff top for about a couple of miles keeping Ingleborough on your left and the shoulder of Whernside on your right. At the far end of the plateau, before it starts dropping town towards Ingleton, curve round to the right to meet the bridleway at Ewe Top, distincively carved through limestone pavement at this point. Turn right here to follow the track back towards Ellerbeck. There are some fascinating fluted limestone pot holes on this section of moor. As you head back it is not always obvious which is the correct track though some waymark posts have been installed recently. Keep Ingleborough on your right and the slopes of Whernside on the left coming back and you won't go far wrong. Eventually you will get back to the Ellerback ford, or if you've taken a different path you might hit the track down to Chapel-le-Dale, in which case turn left up hill to get back to the ford. Then retrace the outward route back to Broadrake. 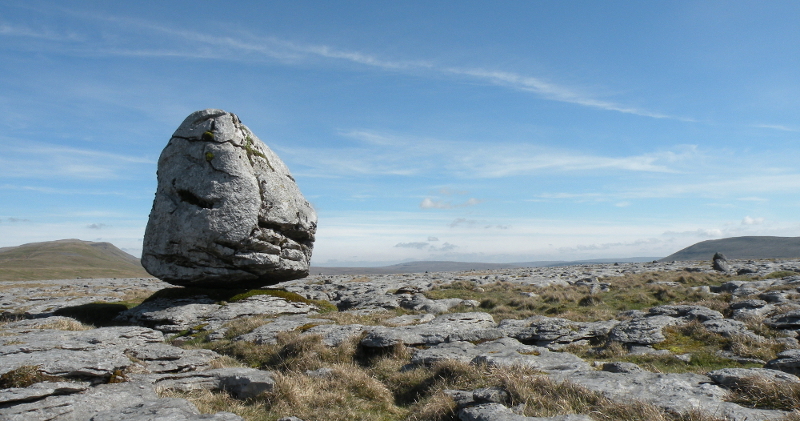 Treat this route decription as a guide since Scales Moor is a fascinating place to explore with impressive limestone pavement and a strange assortment of stone structures, cairns, sheep folds and shepherds huts. Go in clear weather and on the outward journey keep Ingleborough on your left, Whernside on the right, then the opposite for your return.